Bheem along with his friends Raju, Jaggu and Chutki have great time in Dholakpur Watch Chhota Bheem fight in all seasons for the right reasons. In this volume, see Bheem battle a proud 14 year old martial arts expert from Greece and rescue the Kingdom by defeating him in a wrestling match. 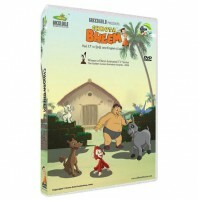 Bheem and his gang teach the woodcutter a lesson and save the Dholakpur forest. Catch Bheem and his gang fight it out bravely.